Can I Cast On Yet? So, I swatched again for the Tangled Yoke Cardigan, this time on US 4s. I'm still not perfect, but I'm much closer. My gauge over four inches was 23 stitches and 33 rows; the pattern gauge is 24 stitches and 36 rows. The row gauge doesn't bother me much. As to stitch gauge, I am going to use that quarter of a stitch to my advantage. I know that this sweater is designed to have negative ease. I am smack dab between the two sizes, so I am going to knit the smaller of the two and allow those extra stitches to get me to a slightly larger real-life size. But, I'm not allowing myself to cast on just yet, as much as I want to. 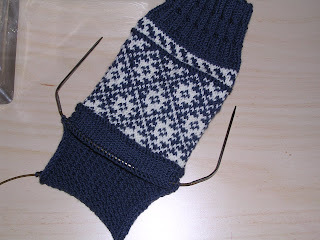 I am still working on the two other sweaters, and they're taking enough time without adding a third into the mix. Trust me when I tell you this sock is absolutely adorable on, and the colors are much more vibrant in person. Granted this is not a colorway I would have selected on my own, but it works very well with this pattern and is behaving itself (no unsightly pooling!). The pattern itself is very quick: a lace cuff (20 rows) followed by an inch and a half of ribbing and an inch of stockinette for the rest of the leg portion, an eye-of-partridge heel, and easy-peasy stockinette foot. Although I only picked up the second sock -- for reals -- last night, I'm already into the gusset. 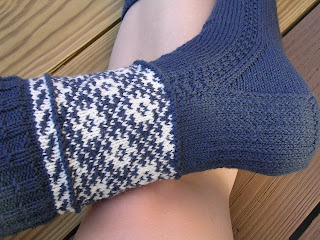 This pair should be done by the end of the weekend, or at the very first for the beginning of Socktoberfest! 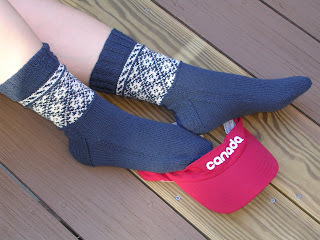 Thanks for all your compliments on the Canada socks. I'm quite pleased with my first "real" stranded colorwork, and I've certainly been bitten by that bug. I'm not sure the Soft Sea Wool was the best yarn to use; it has a rather bumpy texture, and I think because of that the colorwork portions aren't as smooth or distinct as they could be. 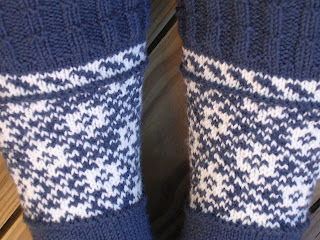 But the socks are incredibly squishy and comfortable, and I know come winter I'll be glad to have them. Knitting continues apace on the two sweaters. The Seamless Hybrid isn't moving very quickly; to be honest, I haven't given it much attention the past few days. The CPH is coming along faster (as you would expect for something at a larger gauge). 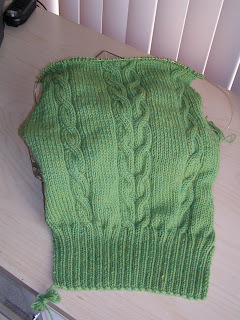 The back was complete last Thursday night, and now I'm about halfway through the left front. Seeing as we're still experiencing highs in the 80s, I'm in no hurry to finish a hoodie at the moment. Unfortunately, my gauge is way off. I'm getting about five stitches to the inch, and I need to be getting six. So tonight I'm knitting another swatch (going down a size) and hoping for the best. I'll be okay if I'm off by a stitch or two, as I'm between the sizes given in the pattern and can use it to my advantage, but being this far off makes my head hurt to even begin to think of the math involved! From far and wide, O Canada, we stand on guard for thee! Mods: For one thing, I decided to stick with two colors for the colorwork (the pattern called for three). 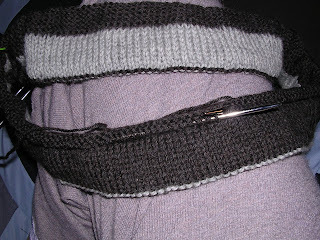 I also completely switched out the cuff, opting for a simple 2x2 rib with a couple purl bands for texture. I shortened the leg by an inch or so and subbed my standard wide toe. These were such fun to knit and are quite squishy and warm. They will be great once sandal weather is over. 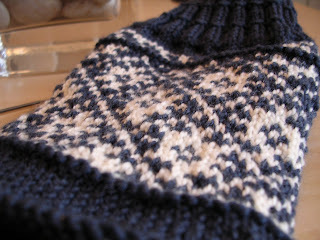 I'm thoroughly addicted to colorwork now and am already plotting my next stranded project. 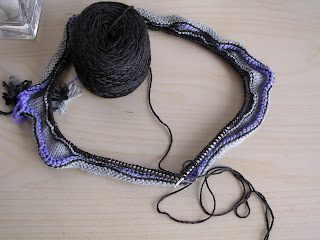 Meanwhile, I finished the back of the CPH and cast on for one of the fronts, put in another inch or so on The Mister's sweater, and finally cast on for the Summer of Love Lace socks (they were the August BFMA shipment -- better late than never, right?). My mojo is back! but I couldn't. Will you settle for some knitting content instead? Knit night was a blast. I think Roaming Tigger (or, as we're now calling him, Taliban Tigger) had the best time. We had a big crowd -- so big that we added a table not once but twice to our original grouping. So big that those of us at one end didn't really get to talk to the people at the other end because they were too far away. We're all hoping the newcomers join us again. For a period of about six years (middle and high school), I refused to wear pink. My mother was shocked when I came home for Thanksgiving my freshman year of college with a pink sweater. For many years, when I was sick or couldn't sleep, I'd watch Little Women -- on VHS. I have a birthmark on the inside of my right calf. It's a little red rectangle. I minored in art history and classics in college; my last class for the classics minor was an introductory course in ancient Greek. I've had two articles published in scholarly journals. I'm still bitter than I never had a sister. I love Indian food, but The Mister won't go near it. The one book I can read over and over again? Pride and Prejudice. Technically I'm supposed to tag eight people for this meme, but I'm going to buck the trend. Instead, why not leave me a comment with a random fact about you? 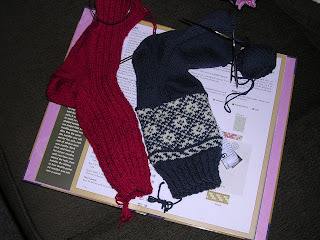 I am crusing along on the second Canada sock -- colorwork is done, heel flap is nearly complete. It's all smooth sailing from here. On tonight's agenda? Finally winding my August STR and the Zen Yarn Garden that arrived last week and turning the heel of this baby. Then sweater? 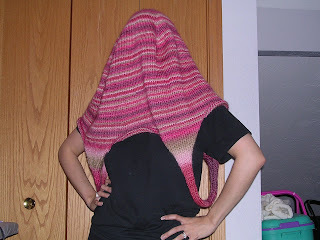 shawl? sleep? I'm saving my knitting energy for tomorrow night. Or so it seemed. 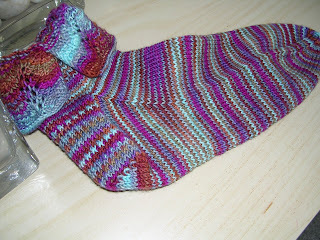 But over the weekend, thanks to some seriously determined knitting, the second sock was finished. I still can't believe how long these socks took me to knit. Yes, I was knitting other things at the same time (including another pair of socks and two sweaters). 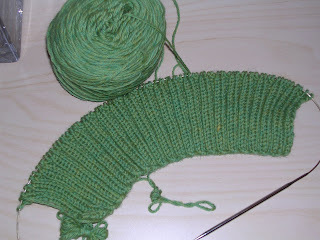 Yes, there was ribbing involved all the way down the [very long] length of the foot. But it was a simple pattern and these were my traveling socks. Never before -- or at least not since I became a sock addict -- has it taken me so long to finish a pair. My excuse? Well boredom, for one. Although I love the texture of garter rib when it's on the foot, it's hard to get excited about it while knitting. But ultimately the real time-sucking culprit of these socks was the yarn. In terms of it look, feel, and fiber content, it's not much different from Knit Picks Essential, which surely you know by now is my favorite all-around heavy-duty sock yarn. The experience, however, was entirely different. I did not like this yarn. It was extremely splitty and annoying thin -- not that I'm so particular about the width of a strand of yarn, but this yarn's thinness drastically affected my row gauge. 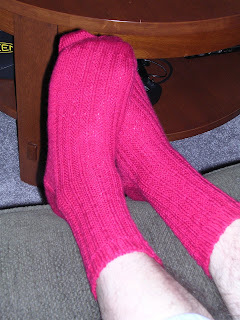 So much so that I made the legs of these socks a full inch shorter than I normally do and still cut it close on yarn. I bought this yarn solely because it was the right shade of bright red, a shade that just is not available in Essential, but I won't be buying it again. Fortunately, there's a happy ending to the story of these socks. The Mister loves them. They're just the right color, and he says they fit perfectly. So while they were a pain to knit, I'm happy in knowing that they'll keep his feet warm (and pretty!) this fall and winter. Meanwhile, I got such a high from finishing these that I cast on for the second Canada sock last night and have been breezing through it. I'm halfway through the main color chart. If I finish that part tonight, I could theoretically finish the rest of the sock by the end of the week. And then I can finally give my full attention to our sweaters. The real question is, which project will come with me to meet with the Hurricane Knitters this week? You'll have to show up to find out! I'm glad you all enjoyed my shots modeling the French Market Bag. It now seems to be dry (three days later! ), so now I can start using it to actually hold some yarn. Like, perhaps, the yarn for The Mister's Seamless Hybrid. Kenny wanted to know some more details about this sweater, probably because he's been doing extensive research and experimentation on his own seamless sweater. So here are the specs, as requested. This is the Seamless Hybrid sweater from Elizabeth Zimmermann's Knitting Without Tears. It's an entirely seamless sweater, knit from the bottom up in simple yet elegant stockinette, and called a hybrid because it's a combination of several seamless sweaters. I was inspired by the version Jared knit -- in truth, I'm inspired by just about everything he knits! The yarn is Cascade 220 (my stand-by), knit on size 5 needles at a gauge of 5 stitches to the inch. Although the mister is a very plain-and-simple kind of guy and would only agree to a muted solid shade, I had to add a little excitement to the sweater with the contrasting facings on the hem. And in true Brooklyn Tweed fashion, I made the hem truly seamless by knitting it into the fabric of the body, rather than sewing up the cast-on edge after the sweater was finished. To do this, I provisionally cast on 90% of the total body stitches (in this case 180) with the purple acrylic you saw in the last picture; I used a crochet cast on for ease of undoing later. 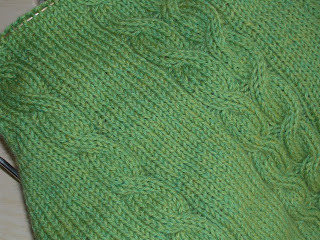 Then I knit one row with the main color -- this is so that the contrasting color doesn't show through in the seaming row. I then switched to the contrasting color (gray) and knit eight rows, and on the ninth row I increased evenly across the row to get to 100% of the total body stitches (an increase of 20 stitches to a total of 200). I kept this final row in the gray to have that little bit showing at the hem. 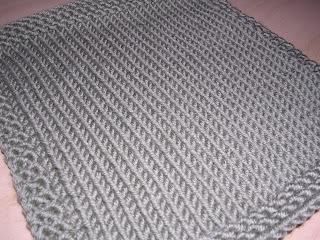 Then I switched to the main color and knit 10 rows, so that this portion was equal to the length of the facing. To join the two sections, I undid the provisional cast on and knit the resulting live stitches together with the stitches on the needle, knitting one stitch on the needle alone every 10 stitches or so to account for the difference in the number of stitches. It's really quite cool how this works. There's a neat row of purls along the bottom of the hem and a cushy double thickness around. I'll do the same hem for the sleeves. This is 280 yards/4 ouncesof handpainted superwash merino from Zen Yarn Garden, received as a prize for SAM3. 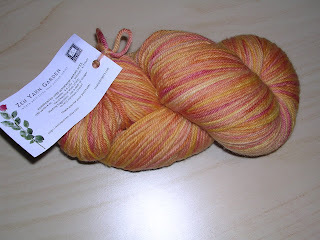 I'm not normally an orange girl, but this skein is especially yummy. It's aptly named Orange Creamsicle; were it not for the furriness, I might just lick it! 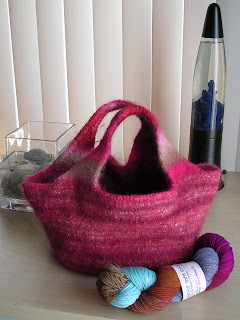 I really felted the heck out of this bag, which is just fine by me. It turned out a little smaller than I'd expected or intended, but the resulting fabric is nice and stiff, meaning this will actually sit open and I can use it to hold my working yarn. Mostly I'm just happy to have this off the needles. Disregard the purple; that's just my provisional cast on (you know he wouldn't wear any color that outrageous anyway!). This is all Cascade 220 wool. The facings are leftover silvery gray from his Cambridge Jacket; the main color is a slightly heathered, muted charcoal-y brown. A tiny bit of the gray will peek out at the bottom of the hem for a bit of contrast, but otherwise this will be a very sedate sweater. And once I get past the hem, this will take the place of the French Market Bag as my mindless stockinette project. So far, it seems to have brought my mojo back to me. Yup, it covers pretty much all of one of the couch cushions. I wanted this bag to be bigger than the first one I knit, but I think I may have gotten a little carried away. Tonight I will be finishing it, and depending on how long that takes me I may throw it in the wash as well to begin the felting fun. Look for a finished bag in the next couple of days. Thanks, gals! Since I've taken so long to publicly acknowledge this honor, just about every other female blogger in the universe has already been nominated, so might I suggest you check out my blogroll? There are plenty of Rockin' Girl Bloggers there -- not to mention a few rockin' guy bloggers as well! The Mister and I would like to thank all of you who have congratulated us on our marriage. You kind words mean a lot to us! 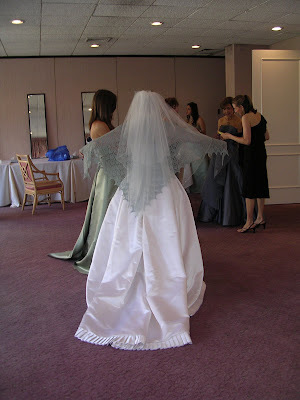 I am now going to stop hijacking my knitting blog with talk of the wedding and get back to the actual knitting content. Some of you have asked to see more wedding pictures, so I'll post some to my Flickr stream for those of you who care to have a gander. For those of you who are here for the knitting, read on -- wool is ahead! In the past couple of days, it's suddenly hit me that it's September -- meaning fall is right around the corner and the holidays aren't far behind. Thus, it's about time for me to get a move on with the fall projects that have long been in the queue. I am anxious to finish these so that I can start on the August STR club socks, which some people finished within a few days of receiving their shipment. I have no such ambitions; I'll be happy if I can get them done before the next shipment arrives. I am absolutely in love with this colorway. 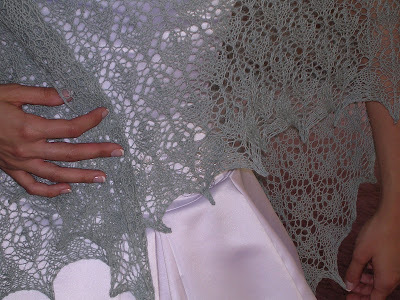 The yarn is my old standby, Cascade 220; this shade is a heathered limey green with flecks of yellow and blue. Just gorgeous. 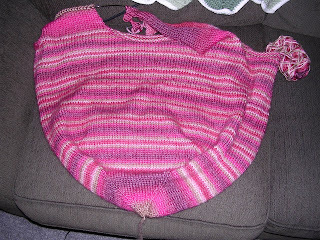 Although ideally I would have finished up a WIP before casting on for this sweater (such as my French Market Bag), a certain someone -- with whom I'm doing a mini-KAL -- started her sweater, and I couldn't be left behind in her dust. Next on the needles? The Mister's Seamless Hybrid -- but that really will have to wait until I finish up the French Market Bag. I've heard of startitis, but this is getting ridiculous! What has gotten into me, do you think? I Do, I Do, I Do, I Do, I Do! We're married! J (henceforth to be known as The Mister) and I went back to work today, so we've been forced to get back to our normal schedules, although we're still doing wedding-related things like writing lots and lots of thank-you notes. We'd like to thank all of you who commented and e-mailed for you good wishes and congratulations! 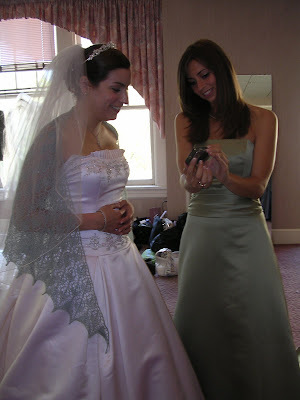 I'm still waiting for one of our many camera-happy friends to send us pictures, but I thought I'd share the few pictures I had my maid of honor snap with my camera. 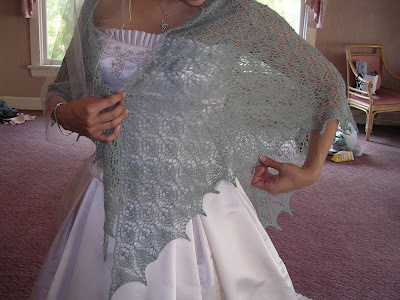 Here's proof for all of you that I did indeed use my wedding shawl! 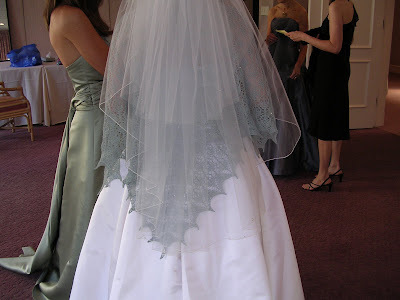 Although it was about 80 and sunny outside, the thermostat in the room in which the bridesmaids and I got ready was set at about 60 and I was freezing! A little alpaca to wrap around my shoulders was just what I needed. 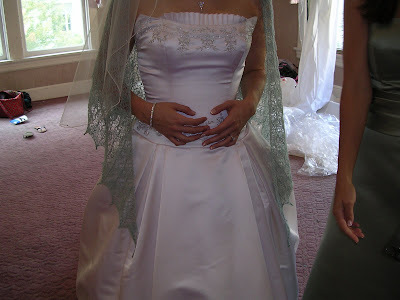 I'm clutching my stomach to see if it's still there under that corset of an undergarment I'm wearing. See the flower baskets now? We are officially in the middle of wedding weekend. I only have a minute, but I did want to post a quick note to let you all know that everything is going well so far and we're looking forward to tomorrow. Thank you especially to those of you who've e-mailed your good wishes for us (I've read them but haven't had time to respond). Regular blogging will resume after the holiday weekend. Enjoy your weekend!